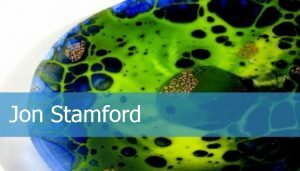 I am a glass artist, based in Kent. I studied Decorative Stained Glass with the glass artist Christine MacCormick in 2003, and Design with the potter and ceramicist Brigitt Head in 2004. 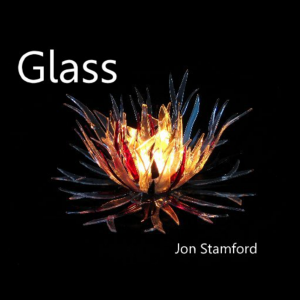 I use glass – and only glass – in various forms and scales. Initially I made secular stained (leaded) glass, creating individualised windows and panels. 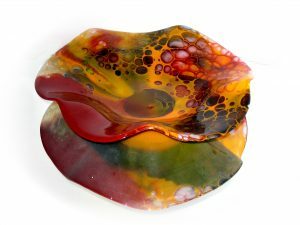 I now use the kiln extensively to paint on glass and to make fused glass bowls, forms and panels. Much of my work is in response to commissions: I have been creating kiln glass and stained glass for exhibitions and commissions since 2003. Making stained glass panels calls for much planning and attention to detail. Before even touching a piece of glass, significant time is spent on the design or cartoon which, although sometimes subject to ad hoc alterations during manipulation of the glass, remains the ‘road map’ to which the glazier will adhere. This approach emphasises two largely distinct phases – design and execution. In many studios, these elements are carried out by different individuals, further highlighting the conceptual separation of these processes. I have always envied potters and glass blowers for the apparent freedom of their working methods, quite different from that of the stained glass craftsman. Although many potters may know exactly the piece they will make before picking up the clay, others respond to the medium while working it. The same is true of glass blowers. The dynamic nature of hot glass demands interaction and a response to the medium. The boundaries between design and execution, between idea and process, become blurred. A piece may start as one thing, but during working, evolve into something quite different as the artist enters into a dialogue with the medium and makes design decisions in response. The artist lets the medium influence the result. At best, this sympathetic discourse between the artist and his medium seems to allow an intensity of expression seldom attained when idea and method are separated. Inspired by potters and glass blowers, I have tried to develop a method of working that encapsulates the key elements of their technique. My approach to my glass is now much less formal and constrained and this is reflected in the objects I make. Often there is no separation at all between design and construction – I will start with a germinal idea and improvise upon it. Sometimes I will produce variations on a design theme. At best the approach is liberating, generating pieces that would not have been likely with a two-step design and construction approach. I often think of this attitude in musical terms as a kind of glass ‘jazz’.